Terribly sad times for democratic-secular India. One of the greatest fighters against rising tide of Hindutva politics, feudal and criminal elements, brave thinker, journalist, publisher, creative writer, activist and a personal friend, GauriLankesh was assassinated in Bangalore. There should be no confusion about the killers. These must be the same killers who earlier assassinated MM Kalburgi, Govind Pansare and NarenderDhabolkar. Is this ‘vadh’ in celebration of Anant Kumar Hegde, a perennial antagonist of communal harmony and communal peace, becoming a Central minister recently? 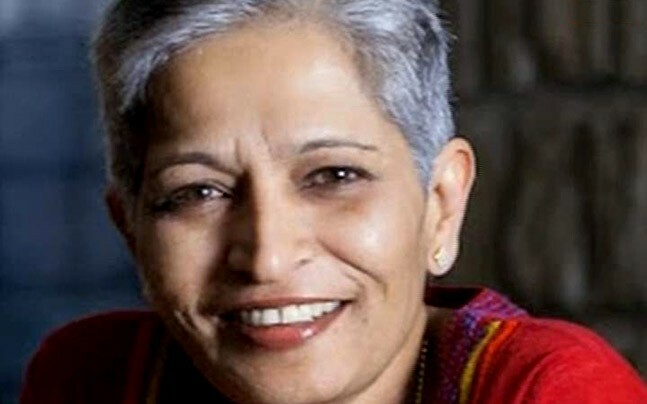 Those who want to destroy democratic-secular India think that by killing Gauri Lankesh they can silence ideas and activities against the anti-national politics of Hindutva and feudalism. GAURI will always live through her work and ideas. One Gauri is killed but many Gauris will emerge to carry forward the task of saving India from religious zealots! BRICS in its recent meet in China rightly identified Pakistani terrorist groups. This important world forum must take note of terrorist organizations in India which are out eliminating opponents of Hindutva politics. The assassination of Gauri is part of of SERIAL KILLINGS of fighters for democratic-secular Indian polity, rights of marginalized/minorities/Dalits/women, against religious bigotry and justice. Karnataka has become a killing field for such brave activists but Congress Government at Bangalore is oblivious of the activities of the Hindutva killing squads. Killers of Professor MM Kalburgi remain untraced so will happen in this case also.